Roberts Automotive holds a pumpkin carving contest and fundraising event each year to benefit their favorite charities. 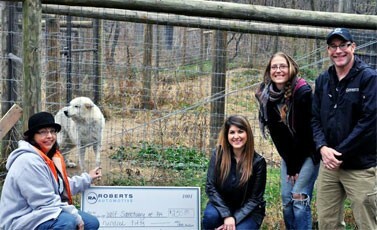 The winner’s charity receives a donation from Roberts Automotive. The 2017 contest winner was our tech, Jason. 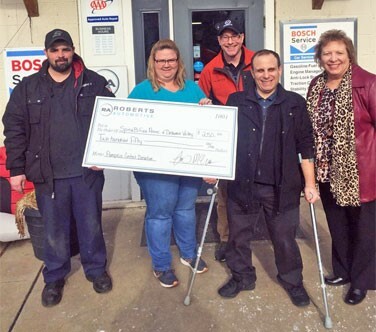 Jason’s Charity, Spina Bifida Association of Delaware Valley, received a check for $250.00 from Roberts Automotive. 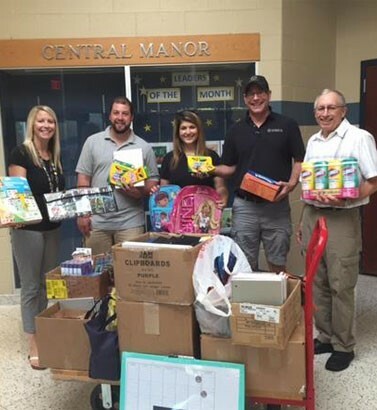 Roberts Automotive initiated a school supplies drive for the children’s program at the YWCA of Lancaster in 2014. 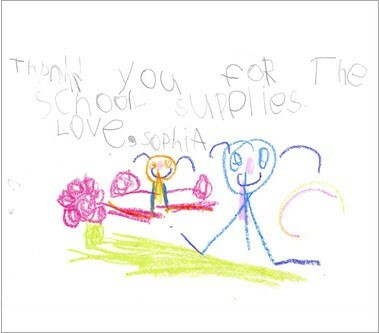 With the support of our customers, volunteers and others we were able to supply the Y with supplies lasting for 6 months. This is a real help to families who are unable to afford childcare and even lack the funds to give their children the necessary tools to help them succeed in school. 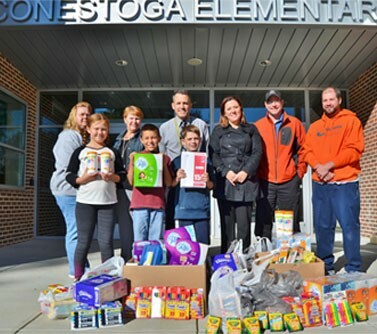 The 2017 School Drive helped students at Pequea, Conestoga, and Central Manor elementary schools in the Penn Manor school district. Customs Classics, Roberts Automotive and all the students and teachers would like to thank everyone who contributed to this year’s Annual School Drive Competition. Roberts Automotive hosts annual community blood drives with the Central Pennsylvania Blood Bank for volunteers and customers to support their community. Central Pennsylvania Blood Bank is a non profit, community based blood program, committed to providing a quality blood supply, responsive to community needs, in a cost effective manner. Roberts Automotive teamed up with Boy Scouts of America to share our industry through the Exploring Post Program. The Exploring Post Program provides exciting activities and one on one mentorship for youth looking to discover their future in the automotive field. 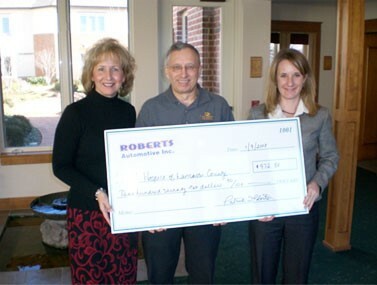 Roberts Automotive donated a portion of its December sales amounting to $972.50 in 2007 to the Hospice of Lancaster County. We chose this charity because of the support they give to terminally ill patients and their families. Hospice of Lancaster County cares for 500 patients and their families each day, as well as providing grief and bereavement support to 5000 local adults, teens and children each month. Roberts Automotive’s philanthropy helps to keep the food bank stocked for families in need. Roberts Automotive is a proud sponsor of the Officer Phil Program through Manor Township Police department, supporting the health, welfare and safety of our children everyday. 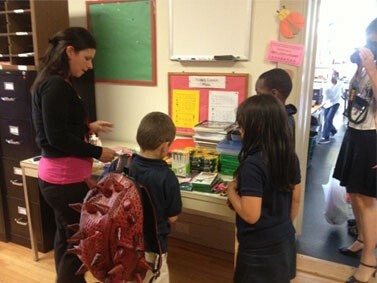 We feel privileged to sponsor a program that teaches children such valuable lessons. 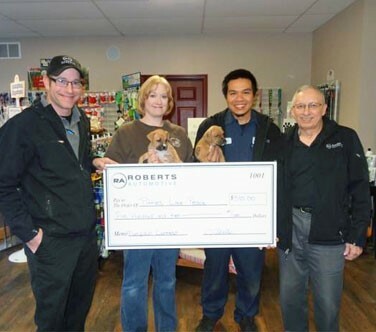 Roberts Automotive dedicated a percentage of every invoice in December 2013 to be donated to the Penn Manor Family Fund, a non-profit organization started by Deb Meckley. 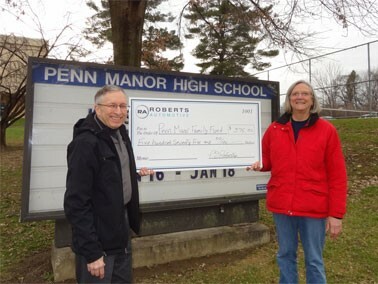 The PM Family Fund provides assistance to residents of the Penn Manor School District providing funds for books, heating, food, electric service, etc. If you live in the district, please consider a donation to this fund. Deb and her crew are a lifeline for families who are hit a rough patch and just need some help to get through it. 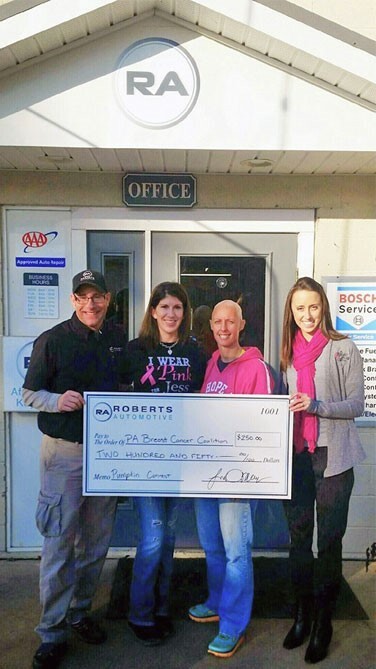 Roberts Automotive is proud to support PMYB. 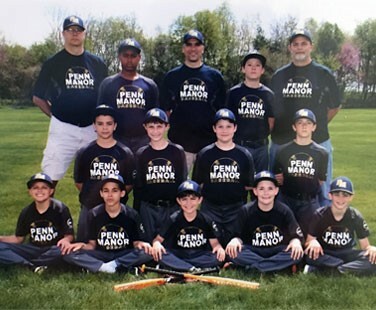 PMYB is a non-profit, community based organization providing baseball to players age 4 thru grade 12 who reside in the Penn Manor School District, Lancaster County Pennsylvania.